Need to get information from your group members? Would you like to generate movement in your group? 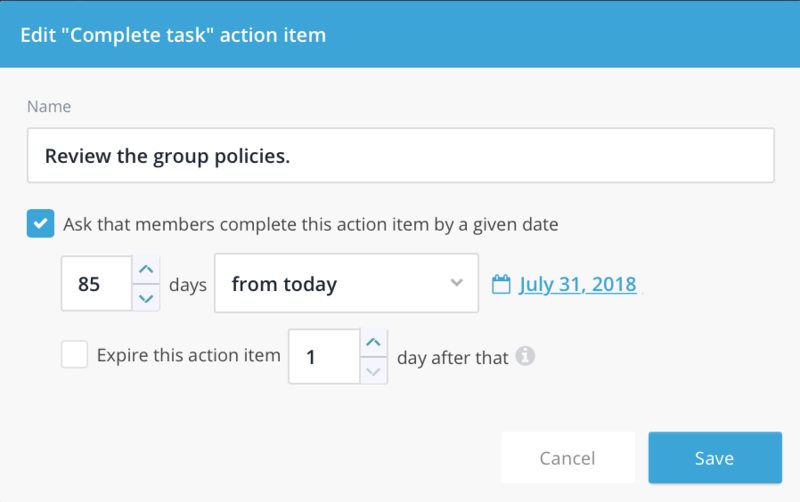 Want to ask your group members to complete a task by a certain date? Using action items is a great way to accomplish your group communication and organizing goals. If you’re unsure of what action items are or how to use them, then read on! Action items are attached to cards. To find them, simply click on “New card” on the group’s board, and you’ll see “Action item” on the left. 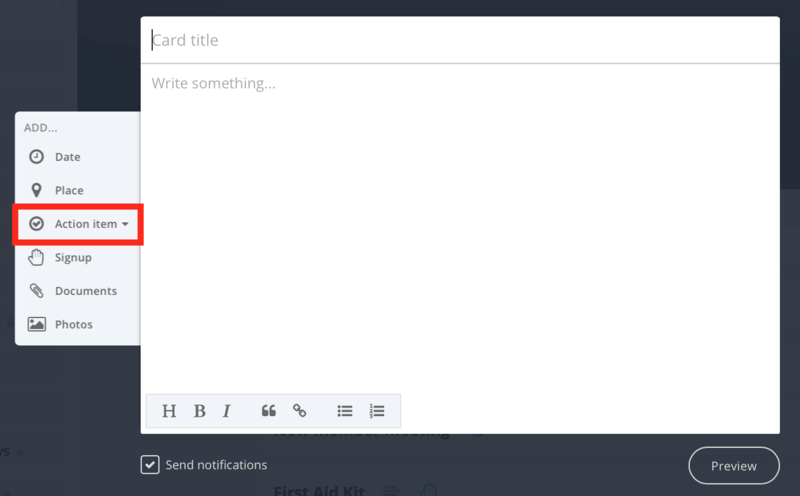 When you click on the action item option, you’ll see a drop down menu that lists all the different action items you can attach to the card. The “Complete task” action item is a great option when you simply need group members to indicate that they’ve completed a task. Perhaps you want to bring their attention to reading the group’s policies and procedures. Or, maybe you want them to introduce themselves to the group. Whatever the task is, the “Complete task” action item is a great choice when you simply want them to check off that something was done. RSVPs have come a long way! From snail mail to instant, online replies, you can continue to enjoy the benefits of RSVPs in Unison. 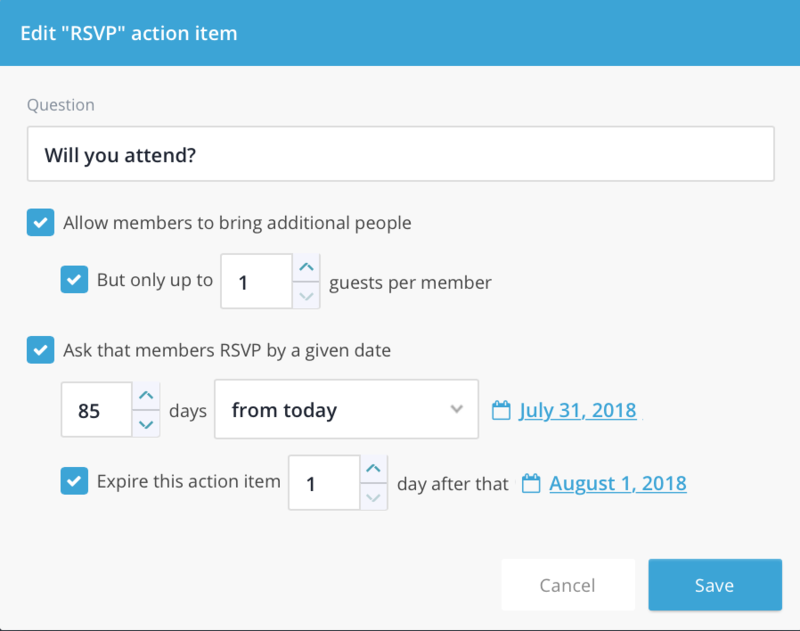 Simply choose the RSVP action item, pose your question, determine how many guests each member can bring, and set a due date, if you’d like. Then, just click save! Got a decision to make? 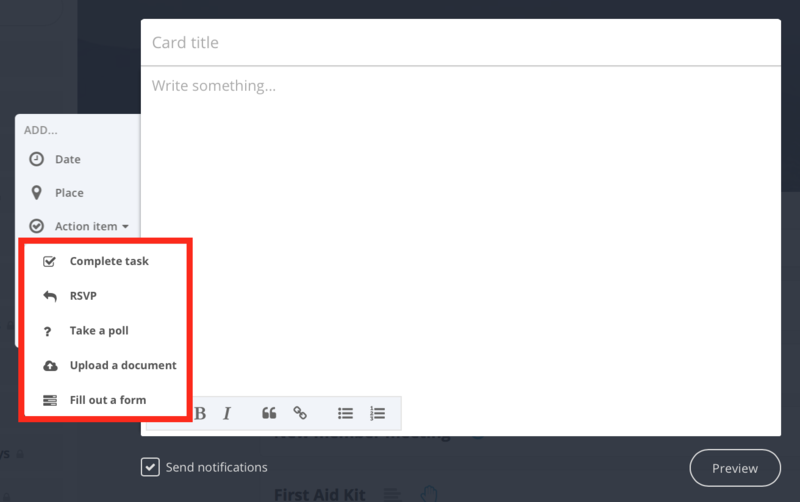 Do you want group member input? Use the “Take a poll” action item to give everyone in your group a chance to add their opinion. 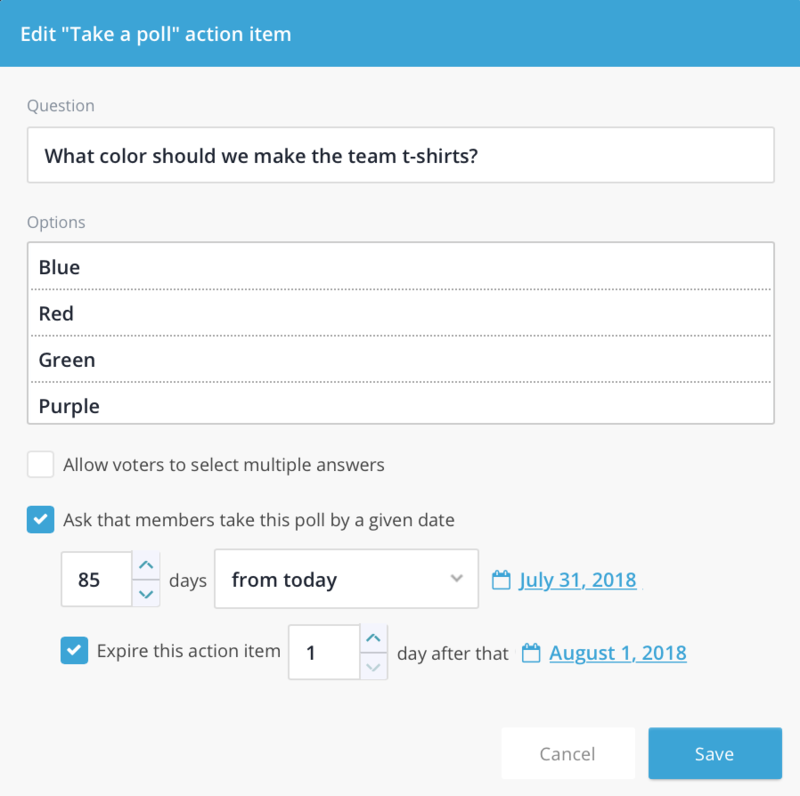 You can poll your group on everything from the color of your next group t-shirt to what day to hold your next meeting. The options are limitless! Often, you’ll need to request materials from your group members. 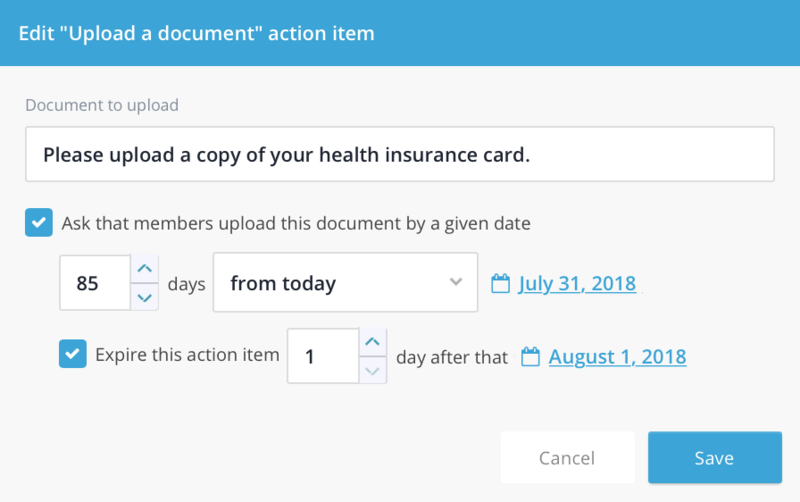 This is easy to do with the “Upload a document” action item. 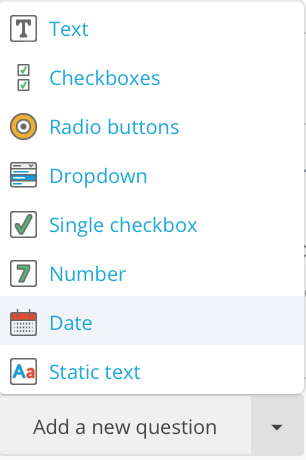 Simply specify the material you need to receive and add a due date, if you’d like, and then click save. Members can upload several different types of files: Word docs, Excel sheets, PDFs, and JPEG images. When the documents have been uploaded, you can easily download them in one easy zip file. At times, you may need to collect several pieces of information from your group members. This is best done through the “Fill out a form” action item. 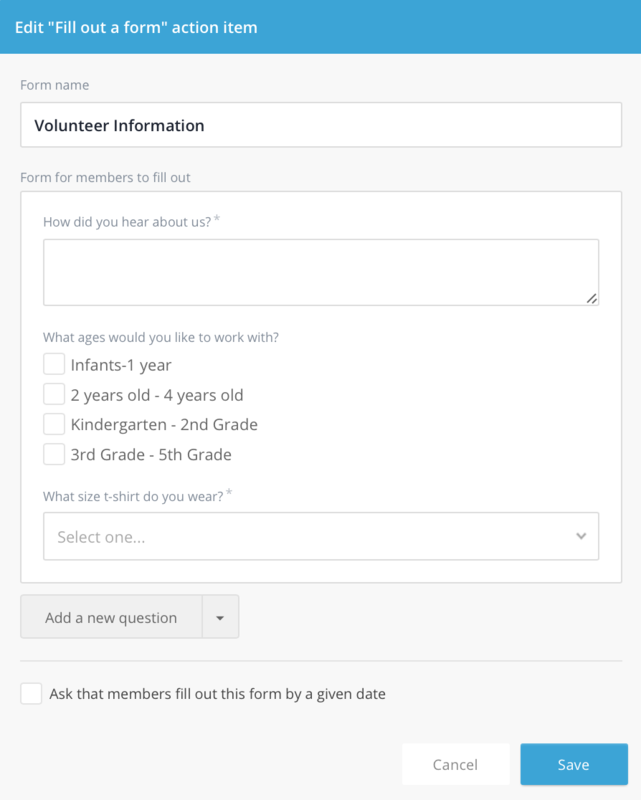 When you choose this option, you can create your own form based on a range of question types. Just choose “Add a new question” to see the various options. You can mix and match these question types to create the form that works best for your needs. Build out your questions to create the form you need. All answers will be viewable by leaders only, and can be easily exported to an Excel or CSV file. With action items, you can mobilize members, move your group forward, and help everyone get things done. Action items leverage the power of technology by making group communication more streamlined, so instead of herding cats and you can enjoy connecting with your group.